This year, I started with soap. Over the weekend, we felted big bars of handmade soaps from two of my favorite soapmakers (and work at home moms), Kristerae at Dreamseeds and Tami at the eponymous Tami’s Soaps. The kids really enjoy it, and when we’re done, we have wonderful bars of soap contained in their own naturally anti-microbial wash cloths. The soap is fabulous for scrubbing dirty knees and feet. Although I used to make it just for the littles, the soap would tend to migrate to the big kids’ and the husband’s shower, so I’ve finally learned to make them for everyone. Barbara from Mielke Farms has directions for felting soap here. 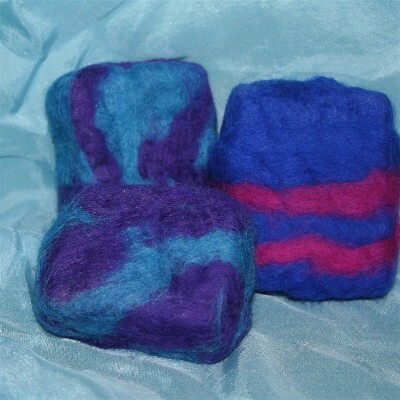 You want a wool that will felt very quickly so you don’t lose too much soap in the sudsing/felting process. Merino is best and although it is more expensive than some other fibers, it takes just a bit to felt a bar of soap so it isn’t too extravagant. Mielke farms has fabulous fibers, as do a growing number of internet businesses. I have a few colorways of hand dyed merino on my website if you are interested in trying this. It is the perfect project with children because they take so much pride in making something beautiful and useful. A perfect gift for grandparents come holiday time! Love your soaps!!! I’ve been thinking about doing this. What do you do once the soap runs out inside?